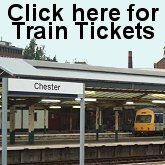 We've listed our hotels in Chester by their distance to Chester's Train Station. You'll find details of their location within Chester as well as the double room price. Chester has a small city centre which can be explored very easily by foot, however you'll still need more than a day to appreciate everything this beautiful historic city has to offer. distances/times are approximate and may possibly differ. winner of the best small hotel of the year 2006! the most luxurious 5 star hotel in chester, located next to the eastgate clock. amazing! budget hotel located next to the racecourse, a short walk into the city centre.